The Dynamic Fiber Conversion System is the battleship of media conversion systems. It's tough, extremely versatile, and manageable, making it perfect for a wide range of network demands. 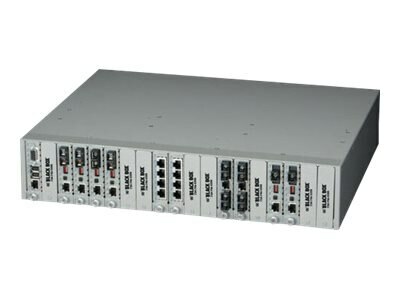 This professional-grade system has more chassis and module choices than any other Black Box offers - multimode fiber, single-mode fiber, single-strand fiber, 10/100/1000 Ethernet, Gigabit Ethernet, a 4-port switch module, ATM, and much, much more! The system is manageable and all modules are hot swappable (although there are special procedures for hot swapping DC power supplies).